TTC Video - How To Look At And Understand Great Art is among the most sublime, meaningful, and redeeming creations of all civilization. Few endeavors can equal the power of great artwork to capture aesthetic beauty, to move and inspire, to change your perceptions, and to communicate the nature of human experience. Great art is also complex, mysterious, and challenging. Filled with symbolism, cultural and historical references, and often visionary imagery, great artworks oblige us—defy us, even—to reckon with their many meanings. What does it take to truly know what you're seeing when you look at art? What technical skills and knowledge are needed to comprehend the full richness of artworks, to unpack the hidden significance of master paintings, sculptures, prints, and more? Award-winning Professor Sharon Latchaw Hirsh of Rosemont College speaks to these and other compelling questions in How to Look at and Understand Great Art. Unlike a traditional survey of art, these 36 richly illustrated lectures take you on an in-depth exploration of the practical skill of viewing art through the lenses of line, light, perspective, composition, and other crucial elements of craft and technique. Using timeless masterpieces of Western painting, sculpture, and graphic art, as well as hands-on studio demonstrations, Professor Hirsh gives you the specific visual and interpretive knowledge you need to approach great artworks, find their deeper meanings, and reach startling new levels of appreciation. Discovering the Artist's Visual Language In building your viewing skills, the opening lectures give you practice with the core technical tools for understanding visual art: Color: You study the essential principles of color and color schemes in painting and graphic art and the distinctive use of color in different epochs, all of which are deeply integral to an artist's work. Line: You investigate the artist's use of line (the basis of art) as it describes reality, conveys expressive meaning, and gives larger structural impact to an artwork. Composition: You learn how the artist constructs a work's overall composition in painting, graphic art, and sculpture. You discover compositional features such as symmetry/asymmetry, balance, and the visual framing of images, as keys to an artwork's comprehensive impact. Signs and symbols: You learn how to recognize symbolism and signifiers in religious paintings, "vanitas" still lifes, canvases of royalty, and seminal works by Gauguin and Dali. Rich and Varied Genres of Art Traveling deeply into the artist's world, you investigate the major genres of drawing, printmaking, sculpture, and painting. You apply your technical knowledge to major works in each genre, exploring the various purposes and types of drawings, the vast spectrum of sculpture and three-dimensional art, and the important traditions within painting and printmaking, with particular attention to how works of art are made. Here, Professor Hirsh takes you out of the classroom and into the studio, in a series of hands-on demonstrations you rarely find in an academic art course. In the lectures on painting, for example, you study the techniques of fresco and panel painting, and you see oil painting demonstrated, including the mixing of colors, the application of opaque oils and translucent glazes, and the texturing techniques of impasto and scumbling used so memorably by Rembrandt, Van Gogh, and the Expressionists. In the complex genre of printmaking, you watch a contemporary artist create original prints, showing you the methods of woodcut, copper plate engraving, etching, lithograph, and silkscreen prints. Your understanding of the techniques of printmaking helps you identify the type of print you're looking at—often tricky even for experienced eyes—and gives you an appreciation of the craft underlying master prints by Dürer, Doré, Whistler, Degas, and others. To deepen your insight into subject matter in art, additional lectures are devoted to the importance of landscapes, portraits, and self-portraits. 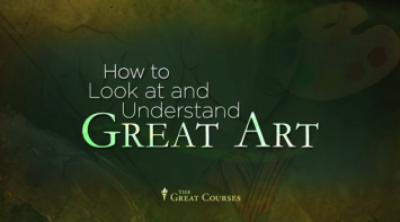 Great Eras, Visionary Movements In the course's final section, you use your newfound skills to explore the major eras and movements in Western art, from the Renaissance to the present. In this unfolding progression, you encounter the stunning diversity of artworks from the early Renaissance to the Baroque and Rococo, from 19th-century Romanticism to Impressionism, from 20th-century Expressionism to Cubism, Surrealism, and Modernism, and finally to Postmodernism and the art of our own times. The knowledge you've developed allows you to recognize and appreciate the dramatic evolution of art, not merely in historical terms, but through specific understanding of how artists work. In the Limbourg brothers' Hours of the Duc de Berry (15th century), for example, you see their attempt at linear and aerial perspective; later, you see how these techniques were gloriously perfected by Masaccio, Leonardo, and other Renaissance masters. You observe how the impact of El Greco's Mannerist masterpiece Pentecost rests on an anti-Renaissance elongation of figures, unusual poses, and use of tertiary colors. Of huge value for appreciating modern and contemporary works, you delve into the human experiences and ways of thinking that gave birth to abstract and nonrepresentational art. Here, you study influences such as the three phases of Cubism, the ideas of Kandinsky, and the penetrating imagery of Franz Marc, following the bold and thoughtful moves that freed art from imitating nature. This understanding allows you to grasp the inspiration and visions of De Kooning, Miró, Giacometti, Pollock, and other masters of the modern era. A Visually Rich Learning Experience Drawing on works from public and private collections, this course brings masterpieces from more than 250 of the world's greatest artists together in one place—making this thrilling course a virtual museum of art you won't be able to find anywhere else. Professor Hirsh's lectures come complete with - more than 950 works of art, presented in crisp high-definition that allows you to zoom in and explore their tiniest details; - meticulously crafted 3-D animations that reconstruct particular works; - on-set demonstrations that explain specific painting methods and techniques; and - visits to an actual artist's studio where you get a first-hand look at the secrets of printmaking. Winner of the Charles A. Dana Award for Distinguished Teaching, Professor Hirsh combines a remarkable breadth of knowledge and a gift for demystifying both the imagery and the motives of art, leaving you with lasting insight into classic masterpieces as well as challenging contemporary works.